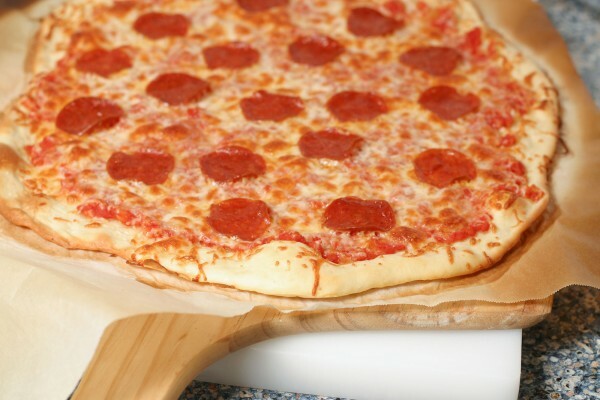 Successfully making thin crust pizza at home is not an easy task. When I have tried before I end up with a crust that over cooked and cracker like, or one that is limp and under cooked. That is why I was so happy to see that Cookâ€™s Illustrated had done some testing and made some discoveries. Their big finding was that it is better to use all-purpose flour than bread flour or other high protein flours. The bread flour retains less water than lower protein all-purpose. In a red-hot 800 degree pizza oven this doesnâ€™t matter being the crust browns and the toppings melt before the crust has a chance to dry out. However in a home oven that only heats to a measly 500 degrees, a bread flour based crust will get all dried out. 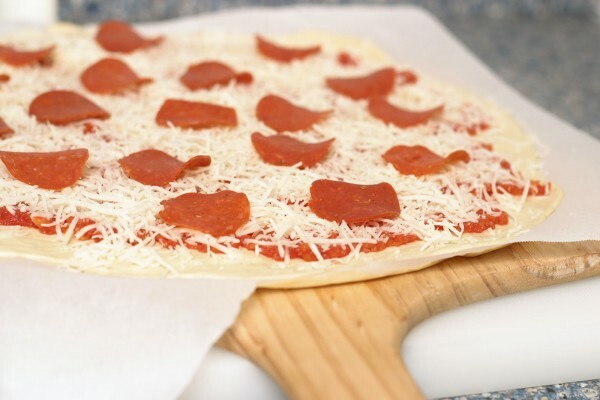 I havenâ€™t had a chance to try this on normal crusts, but the thin crust pizza I tried with all-purpose flour definitely backs this up. Go for an all-purpose flour with less than 10.5% protein, I used Gold Medal All-purpose. King Arthur all-purpose flour might have too much protein. The other great suggestion from Cookâ€™s Illustrated is rolling out the dough, and covering it with plastic wrap. When you cover it you do not have to keep adding flour to the top to keep it from sticking. They also recommend rolling out the dough right on parchment paper which you bake it on in the oven. Also, pizza stones definitely help achieve that crisp crust. You will end up a dough that has more flavor and is easier to work with if you let it rise overnight. 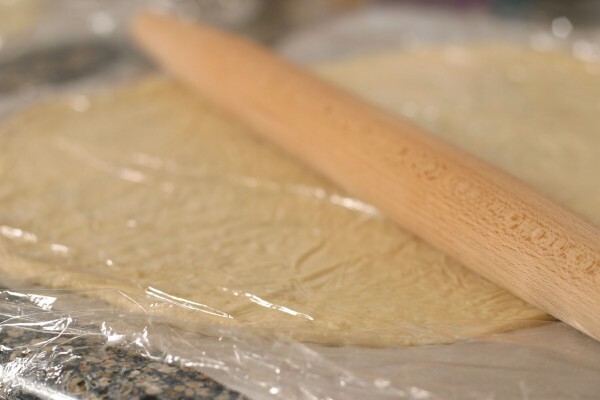 If you are in a hurry you can up the instant yeast to 1 1/4 tsp and let the dough rise for an hour before rolling it out. Texture of the dough was excellent, but IMHO it is way too oily! Very nice descriptions though, the procedure works well. This recipe was just what I was looking for. Accidentally used bread flour, and didn’t let it rise very long. It was still excellent, thin, but not brittle, and a little brown on the bottom. 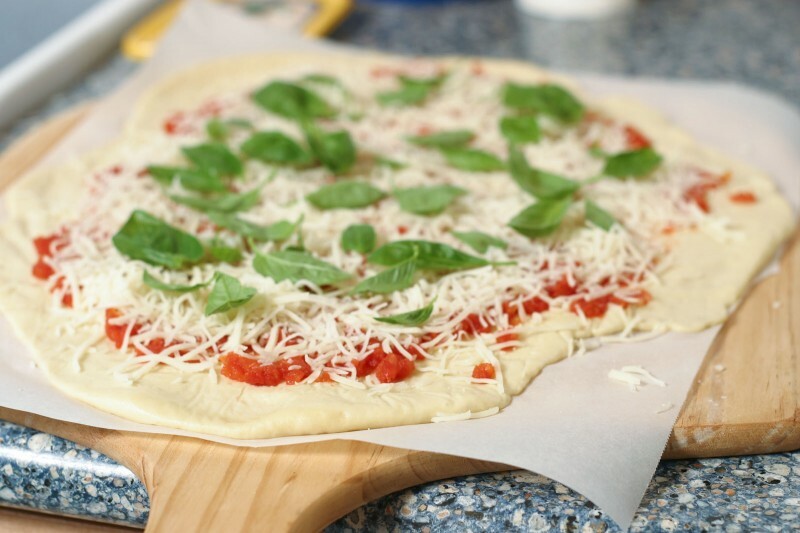 The parchment paper makes the dough easy to roll out and slide onto and off of the stone. What a great idea. I plan on making this again this weekend, but I think I’ll follow the directions and use all purpose flour and let it rise in the refrigerator overnight. 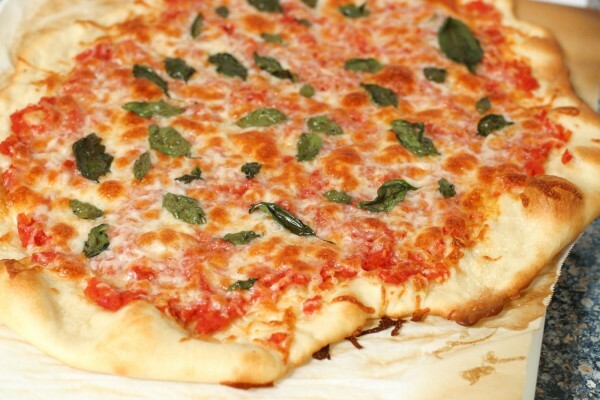 I have been making this pizza crust recipe for over a year now and everyone who tries it begs for the recipe. 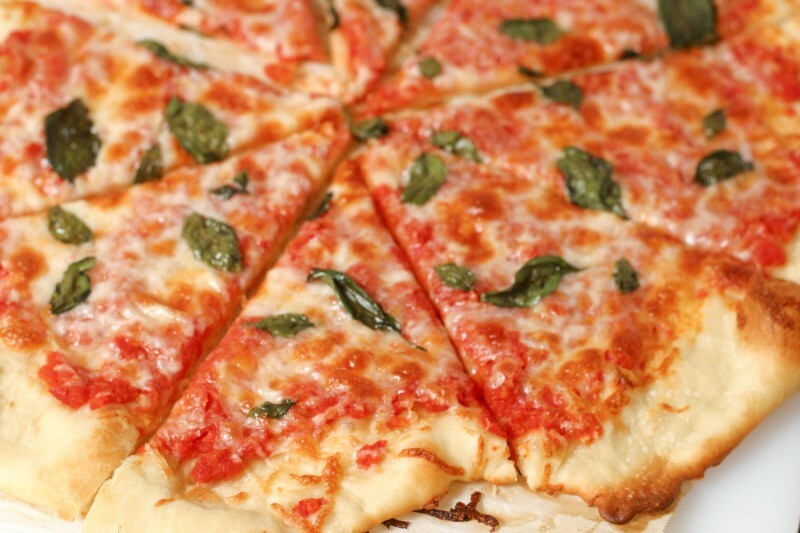 This recipe has made me famous for my pizza making skills. It helps to have a great oven with a bake stone feature and definitely preheat for one hour. I make the recipe exactly as is. I don’t use the sauce recipe as I have my own. Most of the time I skip the tomato sauce and brush stop top roasted garlic and EEVO on top, layered with whole milk mozzarella, roma tomatoes, salt, feta cheese on the tomatoes, italian seasoning and garden grown basil leaves. To die for. OH…and a glass of wine. I watched the video of the like that you gave of cooks illustrated they did not put honey. *or* should I add all but 2 **tsp** of water and then subsequently if the dough is too dry then add 1 tsp and then add another 1tsp if needed. Oh, this *is* good. Baked on a stone at 500 degress for ten minutes and it comes out nice and crispy, but not dry. We rolled up the edge of the dough to make a lip to contain the sauce and stuff, and the outer crust was still nice, not cracker-like. This is great information about the bread flour, thanks! You mentioned the baking stone, and I think that’s one of the most important ingredients. We use ours and bake at 425 degrees; the crusts are light and crispy. Thanks again! oohhh..it is now…12.44am, and I’m not supposed to have supper but this…this might just push me over the edge.